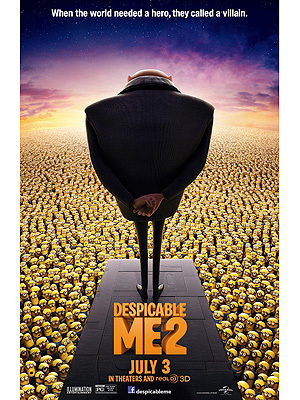 Super villain Gru (Steve Carrell) and his lovable Minions are back in the new Despicable Me 2, which is now in theaters. But this time, the now dad-of-three is using his evil powers to help save the world – and hopefully find love. To celebrate the movie’s premiere, we’re giving away a prize pack full of fun toys, games and more. It includes a Minion USB Drive, Despicable Me 2 Monopoly, Despicable Me 2 Operation Silly Skill Game, Despicable Me 2 Funko POP! toys (Gru, Agnes, Minion Carl, Minion Dave), a Minion Plush Doll, a Minion journal, Minion T-shirt, Minion magnets, a Minion squishy toy and a Minion tote bag. Hurry up and enter for your chance to win here! Online entries must be received between 12:01 a.m. Eastern Time (“ET”) on 7/8/13 and 11:59 p.m. (ET) on 7/14/13. See Official Rules. Tuesday is going to be bananas! And to get in on the fun, U.S. of Awesome has launched an adorable video encouraging everyone to get out and express their right to rock the vote. Featuring a toddler outfitted in a cute monkey costume who wreaks havoc on the polling booth (before settling down to enjoy his tasty treat! ), the short clip is intended to poke fun — and provide a few light-hearted laughs — at what happens when you don’t mark your ballots. The video (check it out below!) is also an extension of the company’s 2012 campaign clothing collection, which includes their comfy Love to Vote tees that are made entirely in America.